Tonight I went out with co-workers for our holiday dinner. Cornell's in Schenectady. I've been there once before, and it also happened to be a work related event. They really like this place. Anyways, we had dinner and drinks and wrapped it up with a "grab bag" thing. I forget what they actually called it. 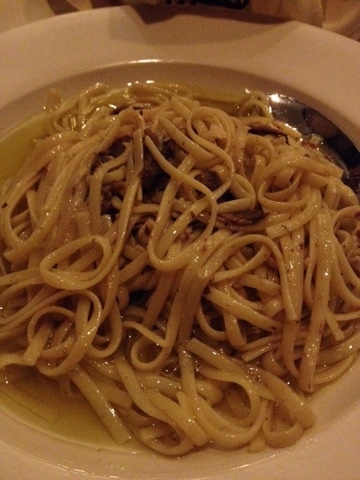 I kept it simple and ordered the Olio e Aglio (aka garlic and oil) over linguine and added on anchovies. Garlicky, salty, and pasta done just right. This dish was quickly devoured. My co-workers on the other hand, barely made a dent in their meals (the eggplant parm was big enough for two people). I thought I would have enough space for dessert, but I had to say no. Oh well. Excuse to come back. As for the gift swap, I ended up leaving with a neck muffler/cowl thing. I started off with a necklace in a porcelain egg in a metal box with puppies on it. I think it's fair to say I moved on to a better gift - I've been looking to buy a cowl, and now I don't have to. I headed home happy and full and finally got around to cleaning out a junk drawer. Amazing how much paperwork I have piled up that I don't need. I can now open and close that drawer without worrying something may come flying out. Now the not so good. As some of you know I have been looking at properties in the area. I would really like to invest in a place somewhere but it has to be a good place. And I think I found one, and have been working on securing the funds to make this happen. But tonight those plans have hit a snag and now I have to start over. Not that this is really a big deal because it just happens... right? It's business. Not personal. Feels a little personal though.